If we want to comprehend the creation of the concentration camps for Romani people on the territory of the Protectorate of Bohemia and Moravia, we must clarify the historical context in which they arose. The problem of the former concentration camps for Roma on the territory of the Czech Republic (available in .pdf format). The tragic fate of the traditional Czech Roma and Sinti became a component of the tragedy of the Roma Holocaust in the final phase of the Second World War which was committed in the death camps through the inhuman racial policy of Nazism. You can read about this history in the document Historical excursion: The concentration and extermination camp at Auschwitz (in .pdf format). The situation of Romani people in Slovakia during the Second World War was different – while the same fate was prepared for them as met the traditional Czech Roma and Sinti, thanks to historical circumstances it fortunately was not fulfilled in all its horror in their case. The Slovak Roma, who comprise most of the Romani population in the Czech Republic today (or rather, their offspring do), live here with different family memories and personal stories, and thanks to that fact, as well as the decades of public silence about the Romani Holocaust, they frequently themsleves know very little about the tragic fate of the traditional Czech Roma and Sinti. This makes outreach on this issue among Romani people living in the Czech Republic today even more important, for example, through discussions, information campaigns, or our own travelling exhibition, “A Vanished World”. You can read more about this in the brief historical excursion Persecution of Roma in Slovakia during the Nazi era (.pdf format). 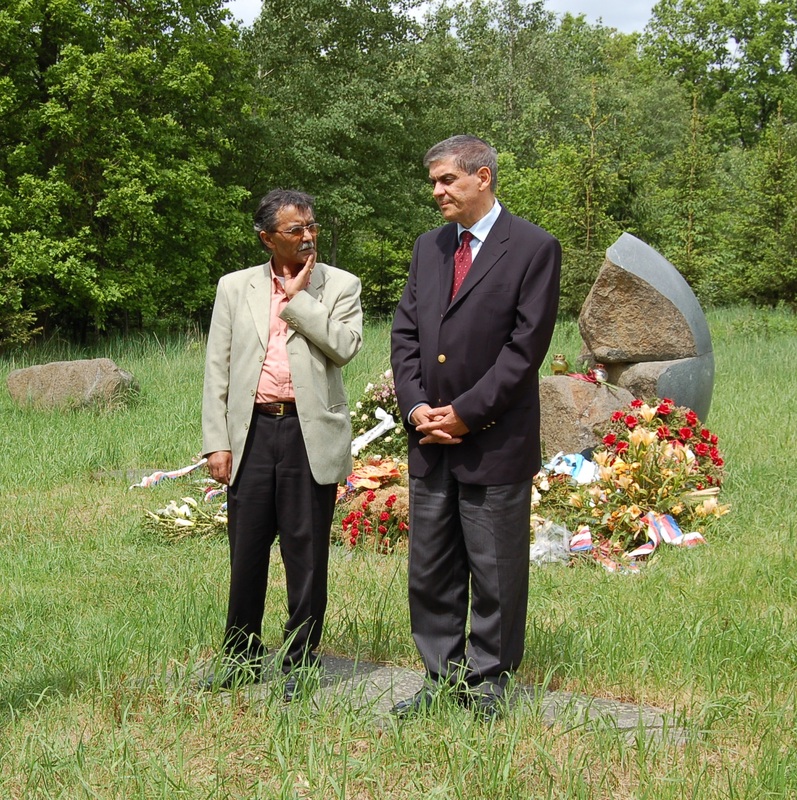 President of the Committee for the Redress of the Roma Holocaust in the Czech Republic, Čeněk Růžička (left) with Romani Rose (right), the representative of the Central Council of German Roma and Sinti, together at the Lety memorial.